The next email was written on the morning of Friday the 13th, 2011. Just wanted to give you an update. When I arrived at the hospital yesterday, Cavin was restless and showing signs of arousal. I put my hand in his and asked him to squeeze it if he could hear me… he did. I asked him to hold up 2 fingers… with delayed response he did, same with wiggling some toes. He still hasn’t opened his eyes, but that is partially due to the sedation medication he’s on. Repeat CT scan yesterday showed no increase in cranial pressure. Will repeat today. Fracture in hip (pelvis) shows no major dislocation. The brain injury explains his combattive behavior when we tried to wake him up on Monday… it is likely that he will have personality change (aggressive, combattive) for months to come as he heals. The lungs are also of great concern… he has pneumonia and is on heavy antibiotics.. We hope to get the tube out of his throat today and wake him up. He is not using his left side much, though every so often he will hyperextend his left leg to stretch it. The left hand doesn’t seem to respond with much strength though it does have some movement. Thank you so much for all your love and support and prayers for him… I know that some of you have been through these types of situations and are probably experiencing your own PTSD!! I draw from your strength, and knowing that the worst of all parents fears has been experience by so many people and that we keep on keepin on despite what happens. Isn’t she amazing! How can someone be so strong and be so articulate during such a difficult time. I am in awe. So I was kinda responding to some simple commands while in a coma. It is amazing how the brain is still processing things even though it is unconscious. I measured 5 points out of 15 on the Glasgow Coma Scale (GCS). The worst rating is 3. A rock has a GCS of 3. I do not truly know how terrible this period was. I only know how terrible the following months were. Apparently I had another failed extubation on May 16th. We had a pretty bad setback today. They took the breathing tube out and put Cavin on a BiPap (??) mouth breathing machine. He lasted 1 1/2 hrs, became panicked, ripped IVs out, etc. They were able to intubate him again but lots of blood coming from his lungs… spiked fever. Culturing sputum and blood (2 sizeable bottles). They worked on him for 4 1/2 hours. He is in bad, bad shape, I’m sorry to report. He had opened his eyes this morning and the doctor made the call to extubate him. Apparently they now feel that his mental status wasn’t sufficient, plus his lungs were not sufficiently strong to have put him through that. Ammon (my father) and I are as scared as we’ve ever been. Tonight and tomorrow are going to be critical to see if they can stabilize him again. They said they’d try to extubate him again maybe at the end of the week. “Diffuse Axonal Injury (DAI) is one of the most common and devastating types of traumatic brain injury, meaning that damage occurs over a more widespread area than in focal brain injury. DAI, which refers to extensive lesions in white matter tracts, is one of the major causes of unconsciousness and persistent vegetative state after head trauma. It occurs in about half of all cases of severe head trauma and also occurs in moderate and mild brain injury. It is ironic that the band that I saw the night of my plunge was called Brain Killer! A diffuse Axonal Injury sure sounds like a good way to kill a brain. The doctors described that I had a DAI and what the outcome would probably be to my mother. She passed the information to some of my family and asked for more information from friends and family, but kept it from MY friends. My family was terrified at this probability. My friend Jenn told me recently that friends and family of hers told her to start saying her goodbyes to me, and they did not even know that I had a DAI. I can not even imagine what it was like to be in my friends’ or family’s shoes. To be suddenly confronted with the possibility of a good friend or family member dying. And there is little to nothing that they could do. Terrifying! The next day they attempted to extubate me again. Current status- extubated him again…can’t seem to rouse him to consciousness enough to cough up what he needs to, though with suctioning and agitation he does cough – they have been able to get a lot of gunk out of his lungs through great effort. His breathing is shalow and fast… and they may make the decision to intubate him again and then schedule a tracheostomy.. where they put a line directly into the trachea. This will be a planned procedure unless they have to intubate him and cant get an airway… then it’s an emergency trach.. and not a good scenario. They were able to get an airway last time, so hopefully they will get one again if needed. He is on the borderline of intubation but they are doing everything possible to prevent having to do it again. That decision is based on his rate of respiration (fast, shallow breaths are not acceptable for any length of time). They have given him Ativan to calm him and pain meds and are trying to keep him calm through the night, suctioning as they can. If he could only come fully conscious he could cough it up… they suspect that the shearing in his left temporal lobe may be the cause of his inability to get conscious for long… He does squeeze one’s hand on command, and wiggle his toes on command and hold up two fingers when asked… though he was less responsive to those commands today. Tonight will be a great hurdle for him to get through, breathing on his own with a face mask. 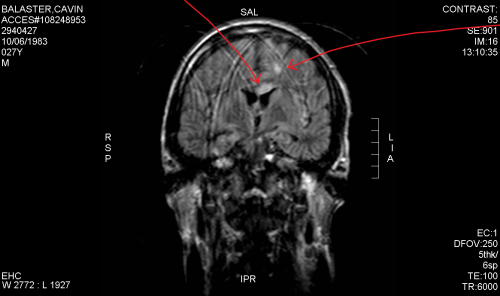 The MRI showed shearing of the left temporal lobe…. I don’t know how severe it is… haven’t been able to talk to the doctor about it. Right now the focus has been on managing the infection…. there’s nothing they can do about the shearing… that will come from rehab. So, he is currently off the ventilator and will hopefully remain so. His fever remains low at 99.1 so he is responding to the antibiotics. They may flush his lungs again tomorrow if he remains unconscious but able to breathe on his own. Time will tell. I’m exhausted. Sorry I can’t say any more, except to thank you all for your love and prayers. It looks like I was extubated and was able to breathe with only a mask now. I still did not wake up. My mom was told that even when unconscious, the brain still processes information. So, sitting next to my comatose brain and body, she began to think creatively about how she could ignite a spark in me. My mother and I have a special relationship because she showed me my first passion… and she knew how much music meant to me. In fact, my mother taught me the first song I ever learned on guitar: Blackbird by the Beatles. Since waking from a coma, I was eventually steered towards a nutritional protocol. And it was after implementing this protocol that I began to regain some clarity. So I used that clarity to study everything I could to give myself the best shot to recover. I was relearning how to walk, so I wasn’t very mobile, but I was able to use this amazing resource that is the internet to listen to podcasts, to read articles, to watch videos, and to take online courses from top universities like Johns Hopkins, Cal Poly Tech, The University of Chicago, and Duke University. I was also able to reach out to researchers and practitioners around the globe, some of whom have become mentors, colleagues, and friends. I confided in, and continue to confide in, these practitioners and researchers for guidance. I was cherry-picking courses and spending time with mentors to create my own major to understand how the brain works, how the brain learns, and how the brain is fueled so that my brain could recover as best as it could. I was studying (and I continue to study) like my life depends on it, because it does! Six and a half years after my injury, I published my first book, which is like the dissertation of the nutritional tools I have learned through my experience, research, and investment. I have been the keynote speaker for several large conferences. I have created two websites (AdventuresinBrainInjury.com and FeedaBrain.com), and an Interview Series, and a podcast where I interview some of the top brain and nutrition experts of our time. I walk. I talk. I eat. I cook. I live independently. I do backflips off of diving boards. I enjoy the eff of my life. And I partner with clients to empower them to choose their treatments, to work with their medical team, and to strategically align themselves to bring about the best possible outcome. To schedule a call with me, fill out this form. 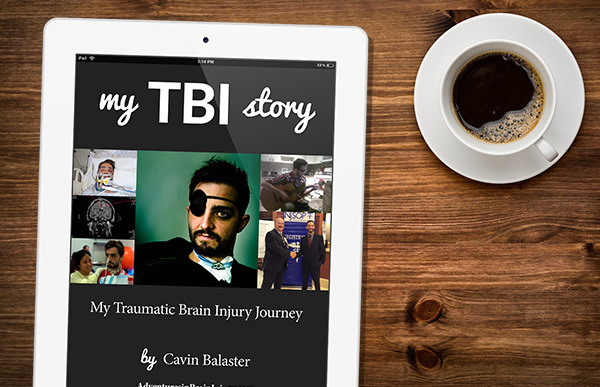 Check out the Adventures in Brain Injury Podcast. 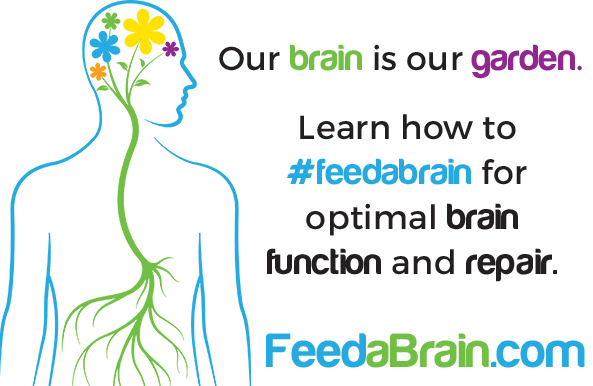 Learn more about where I am at this point at feedabrain.com and pick up a copy of How to Feed a Brain on Amazon. Our son Anthony was hit by a motorcycle while riding his bike to work this past Thursday August 24th 2017. His diagnosis is DAI, though we don’t know the extent of the damage just yet. The last four days have been unbearable at times. I am glad to see your blog and it gives me hope- which I hadn’t felt at all, despite everyone around me who is encouraging and telling me to be strong for him. I guess I’ve been in shock and the despair has been too overwhelming . Today I feel like receiving hope- I am grateful for your sharing this . I hope you are well Calvin. God bless you and your journey. Hi Patricia! I’m so sorry to hear about your son. Let me know how I can help, and if you’d like to explain more or hop on the phone, go to http://www.AdventuresinBrainInjury.com/consult. I am grateful to receive your comment! Let’s have a conversation, and I’ll see what we can do: http://adventuresinbraininjury.com/consult. Looking forward to chatting with you. My husband was hit by a car walking home. He has DAI. Reading your story gives me hope. I pray, pray, and pray. I know God is able!!! Our friend had an awful accident. He was diagnosed with Diffuse axonal injury. It has been 14 days. I am terrified. His lung was punctured and he got pneumonia. The pneumonia has spread to his blood and we don’t know what will happen next. I have so many questions and so little information. Thank you for reading, I have to stay strong for his family and friends but inside I am devastated, sad and scared. I need him to come back to us. My 20 year old nephew was in a bad car accident. He has been diagnosed with DAI. His accident was on Friday and today is Tuesday. He’s on life support. He moves his arms but he does what they call “postering.” Did you do this? They say it’s a bad sign meaning severe brain damage. This evening I visited him and he was moving his toes… he hasn’t done that until today. And when they were trying to suction him he became agitated and actually lifted his left arm attempting to grab the tubes… idk what to think? Is it a voluntary action?? It’s so damn upsetting as one doctor or nurse will say one thing and the next is another story… they tell you not to get your hopes up… wth that’s all we have left is hope and God. My family is a mess!!! hi Calvin, your story gives me so much hope. my boyfriend was a passenger in a bad car accident and has been diagnosed with a DAI he has been in the hospital since June 18th almost 2 months. He has had a set back of pneumonia, he is getting ready to transition to a acute rehab facility. He has a Glasgow score of 10. I am the only person who can seem to get him to follow verbal commands at times. I’ve asked him to raise 2 fingers, to raise his eyebrows, to flip me off, and to snap his fingers. he does all of that. sometimes delayed and sometimes he’s just not up to it seems. his eyes are open all the time he can breathe on his own and sit himself up when he coughs. the nurses try telling me he doesn’t follow verbal command but for me he does and I have taken videos of each verbal command I have got him to do and when they see the videos they are in disbelief. idk I’m confused about all of it and sad.. and if you are able to speak with me I would truly appreciate that. We can do many things, but what is going to be effective is so specific to your husband’s specific injury to his very unique brain. Let’s have a discovery call and see if and how I think I can help you. I’ll email you a link. My husband met with bike accident and diognised with DAI on 20 th October 2018 now he is still in the ICU he squeezes my hand and he opens his little bit he can understand my words he is able to recognise me . They have done tracheostomy and has got pnemonia , fever and is under antibiotics his tongue is also cut , right hand is very weak with very little movement I am very much scared and worried about his recovery. I’ll be sending you an email. Godspeed! My fiancé was in a terrible car accident on 12/14/18. He’s been unconscious since the scene of the accident. He substain traumatic brain injury, jaw fracture, multiple facial fractures, broken ribs. He’s went thru 2 surgeries to fix the fractures and tracheotomy. Since they took the monitor out 2 days ago was able to get MRI, they told me he had DAI. Currently they are winging him off the vent he’s been doing great. Today he just started to follow little commands, or is trying to. How severe was your accident and how long of journey do we have ahead of us? We were working out of state when this happened all our families r 10 hours away. I’m trying to find rehabs for him in our home state when he’s stable enough to be transferred. Plz can anyone help ? Cavin I’m sitting here in the hospital with my 17yr. Old brother. He was hit by a truck and received all the impact. It’s been 20 days now and he’s able to breathe on his own. Commands are not consistent, when he’s awake he seems to daze off into that blank stare. He seems to have built a habit where he fidgets with his hand alot and the only person he seems to understand or listen to is my mom. They have now sent him out of ICU and is in another room with less constant interruptions today is his first day and he is just all over the place with his respiratory numbers and his heart rate. He also has a virus in his lungs and has an ugly cough. I have all the faith in the world especially because of his age and love for life but I really would love to talk to you to get more clarity. I’m so glad you were able to find me while your nephew is already in the ICU! Let’s hop on the phone. Fill out this form and schedule a call (after clicking submit, you will be directed to a page with a link to my calendar). I’m looking forward to speaking with you soon. I read your story and it gave me so much hope. I tried reaching out to you a few days ago but not sure if I did it correctly. My boyfriend of 8 years was in an awful car accident. I’ve been sitting in ICU with him for 6 days now. I am so terribly nervous he won’t wake up but I have immense hope and almost feel his energy in a sense telling me he will be okay. I have so many questions about his situation in compassion to yours. I’m so happy to give hope and I am here for you. Let’s connect and explore how we can bring about the best possible outcome. Fill out this form and let’s schedule a call (after clicking submit, you will be directed to a page with a link to my calendar).